A complete step by step guide on How to Design Interrupt Based Digital Clock with 8051 Microcontroller. Hello friends, hope you all are fine and having fun with your lives. 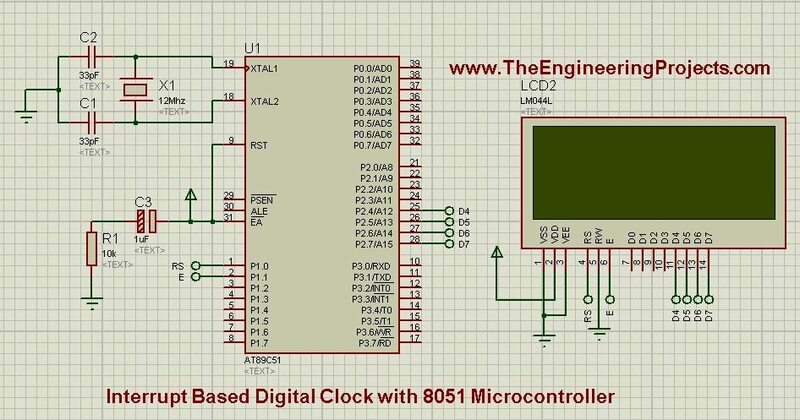 In today’s post, I am going to share Interrupt based Digital clock with 8051 Microcontroller. In the previous post, I have explained in detail How to use Timer Interrupt in 8051 Microcontroller. We have seen in that post that we can use two timers in 8051 Microcontroller which are Timer0 and Timer1. Using these timers we can easily generate interrupts. So, before going into details of this post, you must read that timer post as I am gonna use these timer interrupts in today’s post. Now use the below code and get your hex file. I have designed this code in Keil uvision 3 compiler for 8051 Microcontroller. The above figure is taken after 10 seconds of start of simulation in Proteus ISIS. As the simulation keeps on running the clock will also keep on ticking. The code is self explanatory but let me explain the interrupt function. I have used Timer0 interrupt in this digital Clock. The timer interrupt function is incrementing the userCounter variable by 250 which is in micro seconds. So we need 1000us as it will become 1 second. That’s why I have placed the check that when userCounter == 1000 then increment the second. I have added comments in the code so read it in detail and still if you stuck somewhere then ask in comments and I will resolve them. Thanks admin for sharing this wonderful post. Helped me in my semester project.